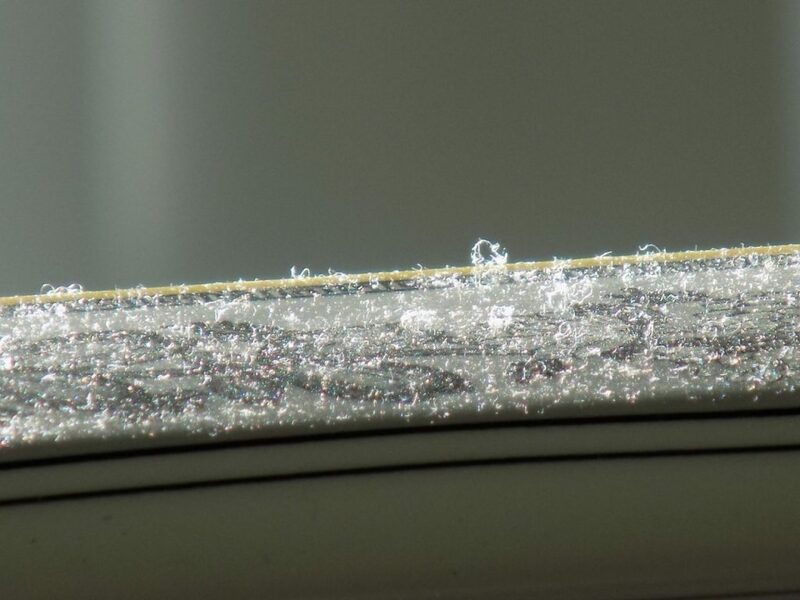 Why are metallic fibers falling from the sky of pacific northwest region? There were reports about mysterious metallic fibers falling from the sky of pacific northwest region. What could be the reason behind this phenomena? Is this something that the world needs to be aware about? As the term geoengineering creeps evermore into public consciousness, people are being persuaded that weather modification schemes will play an important role in public safety as a response to climate change. Most people are behind the curve on this issue, though, as independent journalists and private individuals have for years been documenting what is is happening in our skies. For the last several years, a Washington state resident has been documenting geoengineerinng activity in the skies over the Olympic Peninsula, reporting on unnatural cloud formations, atmospheric spraying, and electromagnetic warfare testing by the Navy. In addition to the obvious manipulations of the sky at large, she has documented an abundance of mysterious white fibrous materials falling from the sky. In a post on September 6th, 2017, V. Susan Ferguson shares the following images along with an explanation of where her research in this matter has led to. All of the photos were taken at her home within the last two years. The substances appear as a wiry dust covering everything outside, and occasionally inside. 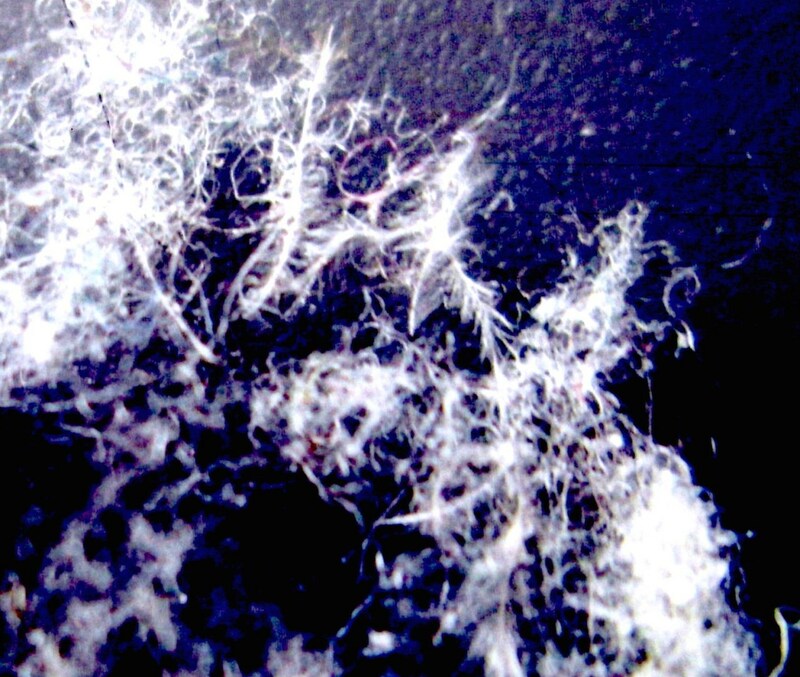 When magnified, the images reveal fine white fibrous materials of unknown material. Speculation on the material and methods of dispersal for this type of event is not limited to Washington state, as there have been similar incidents around the world in recent years. 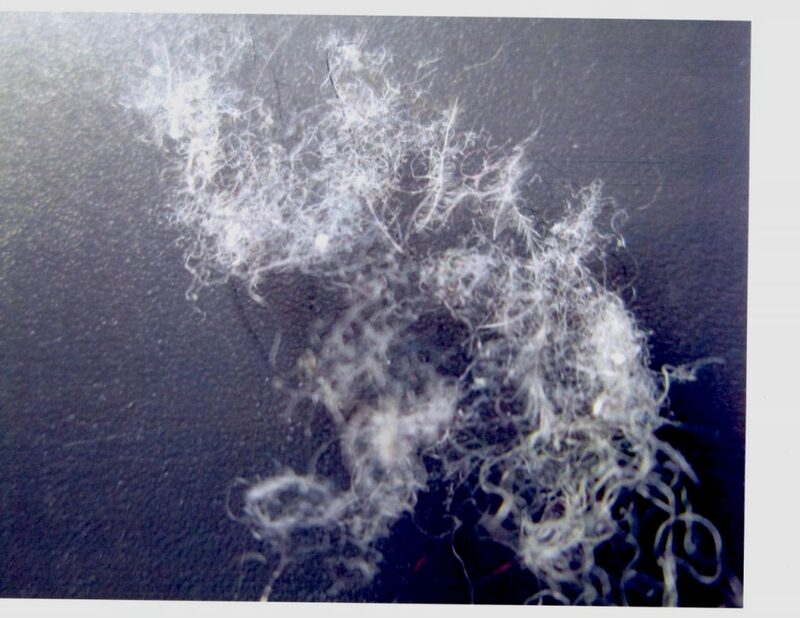 A small publication in France in 2013 reported on a similar fibrous substance which fell from the sky in 2013 after suspicious cloud formations were seen. In West Texas, and Arizona an example was seen in 2015, when many reported seeing larger clumps of filaments descending from the sky and sticking to everything. 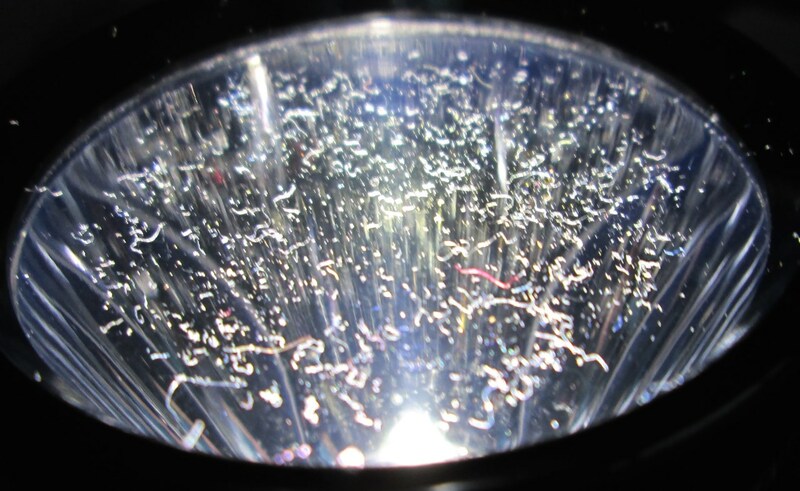 Ferguson took the above photo of the cover of a flashlight after allowing floating material to collect on the lens. Her suspicion is that this material is CHAFF, which is a combination of metallic and plastic strips sprayed by military aircraft to affect communications equipment. This theory is quite plausible given the circumstances surrounding the Navy’s ongoing program of electromagnetic warfare testing in her area, in which low flying and extremely noisy military aircraft frequently fly in this area. The Navy’s involvement here is not a theory, and is publicly known. “The U.S. Forest Service, in a draft decision released Tuesday, will grant the Navy a permit to conduct electronic warfare training with ground-based transmitters in the Olympic National Forest. The training involves Whidbey Island-based EA-18G Growler aircraft crews who would be tasked with detecting signals from ground-based mobile transmitters. The Navy could place these transmitters at any of 11 Forest Service sites under the proposed five-year permit. Conspiracy Theory or Truth Untold? Public knowledge of phenomenon like this is kept under wraps by larger media organizations who report on this subject as if it were a meritless conspiracy theory, even when photographic evidence is presented. Even when no credible government or scientific organization can or will explain what is happening, though, and therefore the citizen’s movement to uncover the truth about chemtrails and government interference with the atmosphere continues to grow. If people are breathing these materials, and their origin and makeup is unknown, then the question becomes, ‘is this phenomenon contributing to public health issues?’ Without fair and earnest reporting into the matter, we may never fully understand what is happening in our atmosphere today and how it is affecting our health.